It’s hard to contain my excitement. This week, Dorie Greenspan published her newest cookbook, Lucky #13, called Everyday Dorie: The Way I Cook. It’s not a baking book this time. It’s an all-round cookbook with enticing pictures. As I browse the pages, so many recipes jump out and say “Make me! Make me!” As always, Dorie’s kind and encouraging voice guides you through the headnotes and instructions. From October 2010 until May 2015, I cooked each and every recipe from Dorie’s previous all-round cookbook Around My French Table. It was an enjoyable and educational journey. Along the way, I met and bonded with a virtual group of cooks who were doing the same. 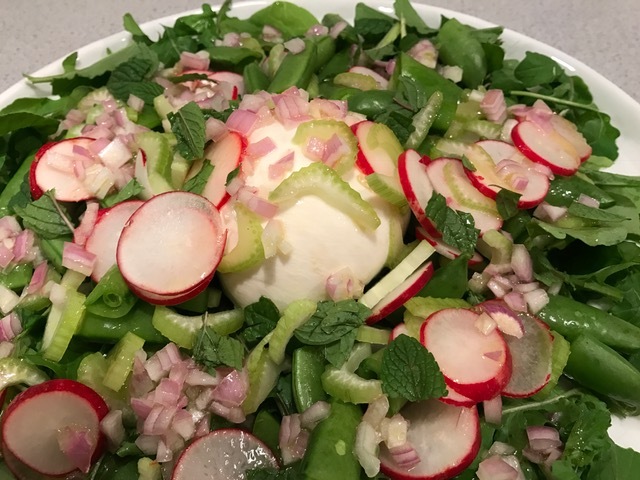 A subset of us have continued to cook together under a group we call Cook the Book Fridays. Sticking with the French theme, we’re currently working our way through David Lebovitz’s My Paris Kitchen. With this week’s new book launch, we’re adding Dorie’s book to the mix. We’ll cook one of Dorie’s recipes each month until we finish up David’s book then continue until we make all the recipes in the new book. Hopefully, more of the original gang will join this new venture. The inaugural recipe I made from Everyday Dorie is My Newest Gougères. “My” is Dorie’s voice, not my own. For those not versed in French food words, gougères are best described as savory cheesy cream puffs. 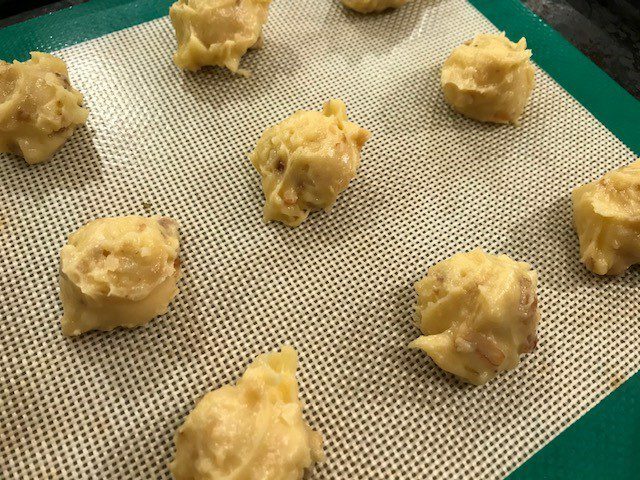 They are made with the same pâte à choux dough as cream puffs with the addition of grated cheese, and in this “newest” version, toasted walnuts and some Dijon mustard. On paper, pâte à choux could seem intimidating, but it’s not that hard. You bring milk, water, butter, and salt to a boil. Then, you add flour, and stir, stir, stir, over low heat to dry out the dough. 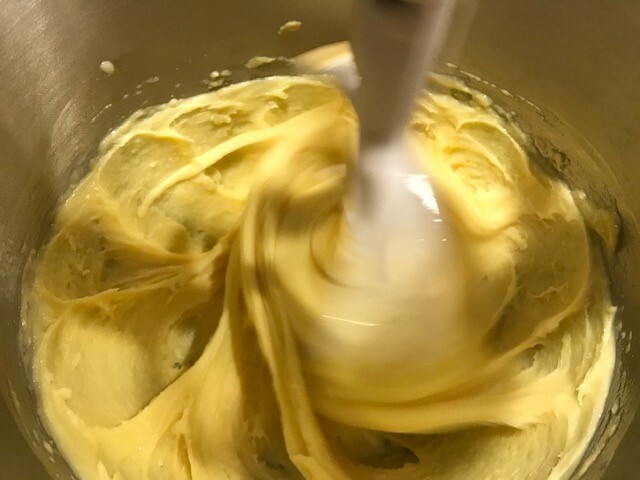 Next, you beat in eggs (a stand mixer is best) one at a time, leaving you with a sticky dough. Finally, you add the cheese, mustard, and nuts. Finally, scoop the dough onto parchment- or silicon-lined baking sheets. I used a small scoop which yielded 6 dozen puffs. We didn’t have any guests, so I baked one dozen to snack on before dinner. The gougères were light and airy. The nuts added a welcome bite. Dorie suggests keeping frozen unbaked puffs in the freezer, leaving you prepared with appetizers when friends stop by for an impromptu (or planned) visit. That’s where the remainder ended up. What a fitting start as the first recipe I made from Around My French Table was also gougères. I must admit that I haven’t made them since. I’m not sure why. Hopefully I remember to make these again before Dorie publishes her next book. You should try them too (recipe below or page 8 of Everyday Dorie: The Way I Cook). Or give me a call that you’re stopping by and I’ll pull some from the freezer and bake them for us to share over an aperitif. 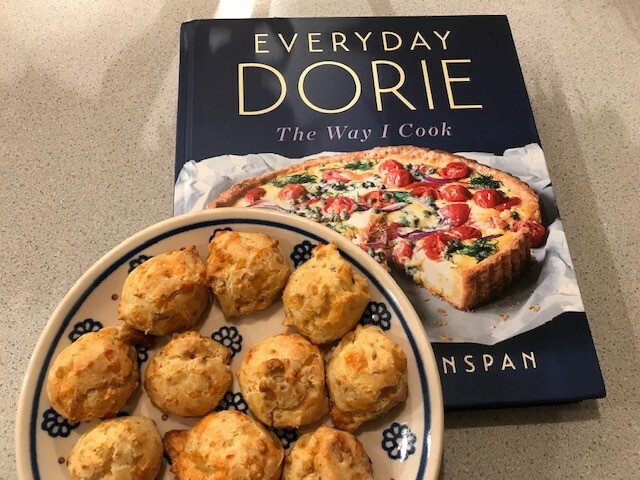 Also follow my Cook the Book Fridays friends’ links here to see what they thought of Dorie’s Newest Gougères. And last, but not least, GO RED SOX!!!!! Gougères are French cheese puffs based on a classic dough called pâte à choux (the dough used for cream puffs), and it’s a testament to their goodness that I’m still crazy about them after all these years and after all the thousands that I’ve made. Twenty or so years ago, when my husband and I moved to Paris, I decided that gougères would be the nibble I’d have ready for guests when they visited. Regulars chez moi have come to expect them. 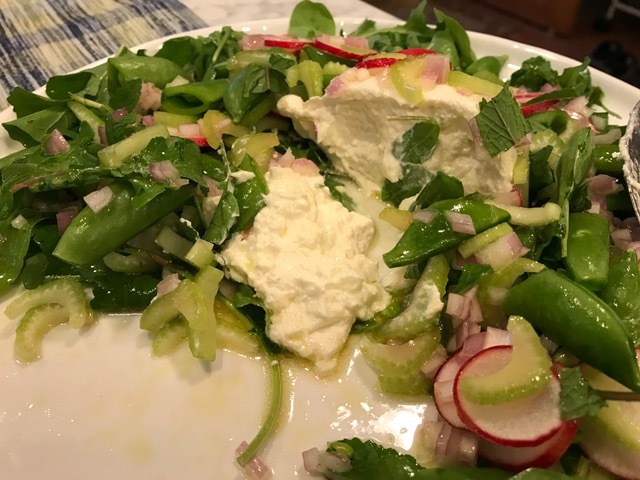 Over the years, I’ve made minor adjustments to the recipe’s ingredients, flirting with different cheeses, different kinds of pepper and different spices. The recipe is welcoming. 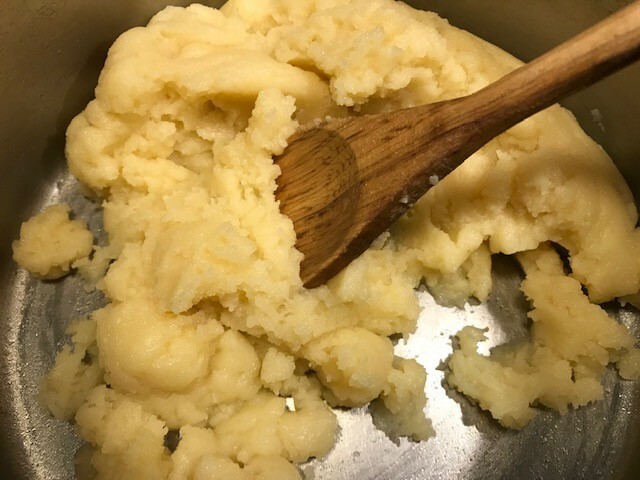 This current favorite has a structural tweak: Instead of the usual five eggs in the dough, I use four, plus a white—it makes the puff just a tad sturdier. In addition, I’ve downsized the puffs, shaping them with a small cookie scoop. And I’ve added Dijon mustard to the mix for zip and a surprise—walnuts. My secret to being able to serve guests gougères on short notice is to keep them in the freezer, ready to bake. Scoop the puffs, freeze them on a parchment- lined baking sheet or cutting board and then pack them airtight. You can bake them straight from the oven; just give them a couple more minutes of heat. Bake for 12 minutes, then rotate the pans from front to back and top to bottom. Continue baking until the gougères are puffed, golden and firm enough to pick up, another 15 to 20 minutes. Serve immediately—these are best directly from the oven. STORING : The puffs are best soon after they come out of the oven and nice (if flatter) at room temperature that same day. If you want to keep baked puffs, freeze them and then reheat them in a 350-degree-F oven for a few minutes.